Thalassemia has been one of the major challenges which is underlying the already inadequately developed Health care facilities in the war ravaged country of Afghanistan. Illiteracy, social set up, lack of awareness, non availability of blood and many other factors are posing a great challenge to health workers who have been working to fight thalassemia. 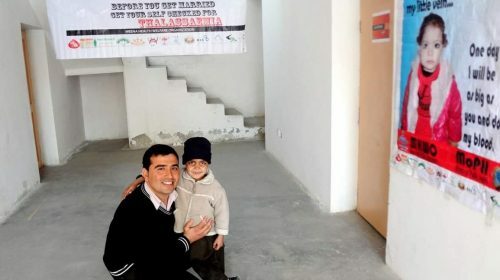 There is little support from the government and hence social workers like Mr Najm U Saqib has been trying hard to spread awareness about thalassemia and bring in much needed help to Thalassemia patients of Afghanistan. Mrs Tinku Rajeev Gupta speaks to this crusader on his dream project MEENA HEALTH WELFARE ORGANISATION, which set up the first ever Thalassemia clinic in Afghanistan. WHAT A BEAUTIFUL DAY, BUT MY EYES ARE NOT OPEN ANY MORE TO SEE IT. LIFE IS TOO SHORT, BUT MY LIFE WAS EVEN SHORTER. I HAD DREAMS, I HAD HOPES, I HAD DESIRES AND WISHES. I WAS SO YOUNG AND UNAWARE OF ANY DANGER. I WAS JUST 14 YEARS OLD SICK WITH “THALASSEMIA”. I NEEDED BLOOD REGULARLY TO HAVE MY LIFE SAVED. I FOUGHT FOR MY LIFE, MY FAMILY FOUGHT FOR MY LIFE, BUT THALLASSEMIA TOOK OVER. I LOST MY LIFE TO THIS DANGEROUS DISEASE. PLEASE DON’T LET ANY MORE LIVES BE LOST. YOUR BLOOD CAN SAVE SOMEONE’S LIFE LIKE MINE !!!!! “That was Meena, my little sister. 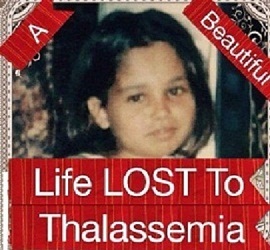 I lost her to thalassemia as her fight for life ended in 2008 at the age of 14. There was no adequate medical facilities available in Afghanistan then. The situation today is marginally better in Afghanistan for Thalassemia patients but a lot more needs to be done. Mr Niazi is a dedicated Social worker who took the initiative of establishing the first ever Thalassemia Clinic in Afghanistan and has been successfully treating Thalassemic patients. Mr Niazi is a well traveled Afghan who belongs to the new generation of the peace loving Afghans. He has a vision of putting Afghanistan in the world map as the most preferred destination which displays the flavour of rich ethnic culture, heritage and a wellness destination. The fight has not been an easy one as Mr Niazi ran from pillar to post. He organised various awareness and blood donation camps. He wanted to see a smile in the pale faces of the thallassemia patients. With no high end treatment available in Afghanistan he has been working continuously to improve the quality of life of these patients. “Education is the need of the hour. Without education no progress is possible.” He says in his appeal to the international community of aid workers and find raisers. He is hopeful of receiving support which will help him provide basic education, health and food to the underprivileged children on an ongoing manner and soon there will be light at the end of a dark tunnel.